When you participate in the Girl Scout Cookie Program, you're doing more than just helping your customers stock up on delicious treats (and having lots of fun). You're doing it with a goal in mind. Whether that goal is a pizza party, a community project, or your first overnight trip with your troop, you know how many packages you need to make it happen. To get started in the program, complete the online interest form. Is your troop not participating or can’t find a troop cookie manager? Girls and their troop can still participate, contact us for more information. November-December: Service unit cookie coordinators (SUCCs) train troop cookie managers. Sunday, Jan. 27, 9 a.m.: Cookie program begins! Want to know about all the benefits of participating in the Girl Scout Cookie Program? Looking for a one-stop shop with the latest safety guidelines, information on earning the Girl Scout Cookie Activity pin, and tips for parents and volunteers working with Girl Scout Cookie Professionals? 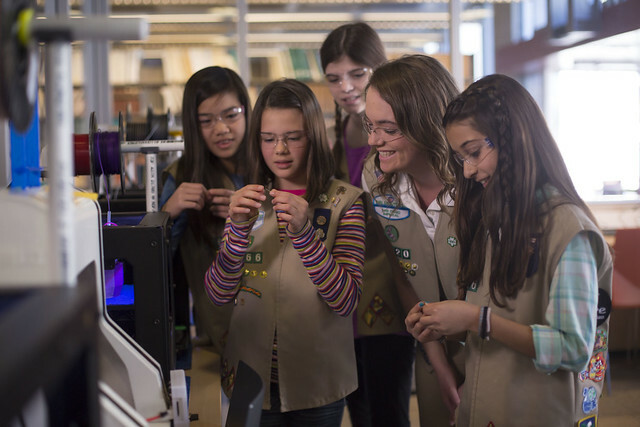 Visit Girl Scouts of the USA’s cookie and product activity page. A complete list of rewards and details can be found in your Family Cookie Guide on pages 10-11. A section 501(c)(3) organization must not be organized or operated for the benefit of private interests. No part of the net earnings of a section 501(c)(3) organization may inure to the benefit of any private shareholder or individual. To comply, unless otherwise stated, only girls and the chaperones we provide may participation in rewards that involve events and experiences. The ratio of girls to adults is determined by the safety guidelines in Volunteer Essentials, a GSUSA publication. Because unexpected incidents can occur, it is imperative to keep safety in mind at all times, including while marketing cookies. During cookie booths, please follow our booth basics. Should a situation occur (e.g., a robbery, aggressive customer), the safety of girls is paramount. Move them to safety and call the police immediately. Do not approach an aggressive individual or chase a thief. As soon as possible after the incident, contact your service unit cookie coordinator and notify Girl Scouts San Diego staff by calling 619-298-8391. (After standard office hours, press “2” when prompted to be forwarded to the emergency phone line. A Girl Scout staff member will quickly respond.) Please review safety instructions with girls and families. Volunteer Essentials and product program safety tips are available on our website for review. Only an official spokesperson may speak for the council. Refer any media inquiries to the Director of Communications, Mary Doyle 619-610-0710 or media@sdgirlscouts.org. Cookie Captains are Girl Scout Cadettes, Seniors, or Ambassadors who have participated in previous cookie programs and plan to participate in this year’s cookie program. They mentor Cookie Rookies, Daisy or Brownie troops participating in the cookie program for the first time. Cookie Captains who complete the program requirements and turn in a final report by Friday, March 15 earn and receive an exclusive 2019 Cookie Captain patch. Cookie Rookies benefit from older girl mentorship and have fun with experienced sister Girl Scouts. If you would like to participate as a Cookie Rookie, and you do not already have Cookie Captains lined up, reach out to your service unit cookie coordinator. To participate as a Cookie Captain, complete the commitment form. An IRM is a girl participating in Girl Scouts independent of a troop. Girls in troops may also participate in the cookie program as IRMs if their troop is not participating; it will not affect their membership status. IRMs must have a trained adult who is registered and background screened to oversee their participation. Get started by contacting your service unit cookie coordinator or complete interest form. To comply, Individually Registered Members (IRMs) earn cookie bucks in lieu of proceeds. Check out photos from our Little Brownie Bakers 2018 marketing campaign photoshoot.